Announced today by Nintendo, as part of it’s 25th anniversary of the original Super Mario Bros. game, which was release on the Nintendo Entertainment System (NES), was the release of their limited edition red Wii bundle which will come with a copy of the New Super Mario Bros. game, a new red Wii Remote Plus controller as well as the standard Wii Sports with, you guessed it, a red Nunchuk controller too. 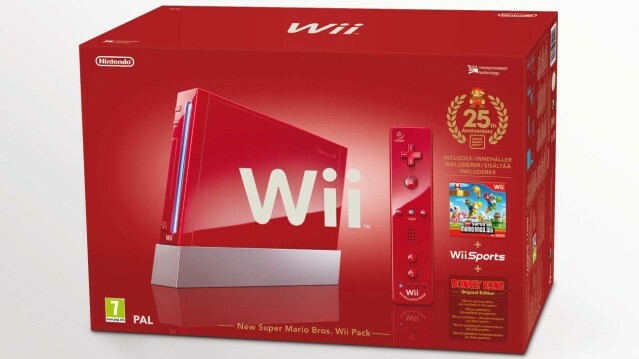 The red Nintendo Wii bundle will become available to all to purchase on November 7th at $199.99. Stock is limited and Nintendo have also said that the bundle will only be available while stocks last. So if you’re an enthusiast then you’ll need to be quick. As well as this, Nintendo will be releasing a DSi XL bundle, funnily enough, in red too. This will include a copy of Mario Kart DS already in addition to the pre-loaded software – Brain Age Express: Arts & Letters and Math and Photo Clock. All this will be available at the same time at a suggested retail price of around $179.99. But is Nintendo trying to break the fun? Launching this new bundle just about 3 days after Kinect launch. It would make the enthusiasts in both nintendo and Xbox screams! LOL.